The following carriers provide frequent direct flights from most major centre’s across Australia. Every arrival at Airport is met by a shuttle bus and taxis that will take passengers into Perth city. The trip will take around thirty minutes. If you’d like to drive yourself, rental cars are available: Hertz, AVIS, Europcar, Thrifty and Budget. Bus Route 40 operates 7 days a week between Elizabeth Quay Bus Station and T3/T4 via Great Eastern Highway, offering the most direct route between Perth Airport and Perth City. Uber ridesharing services are available at Perth Airport. Please wait until you have collected your luggage and are ready to leave the airport before requesting your ride through the Uber app. There are dedicated rideshare pick-up bays within easy walking distance of each terminal. Simply follow the directions given in the app and terminal signage to the nearest rideshare pick-up bay. To help us provide infrastructure that supports rideshare activities across the Perth Airport estate, a $3 airport fee applies to all pick-ups at Perth Airport. You may be asked by your taxi driver to pay your fare in advance. To help provide taxi facilities at Perth Airport, including waiting areas, monitoring equipment and kerbside facilities, a $3 fee is added to your fare if you’re catching a taxi from the terminals. 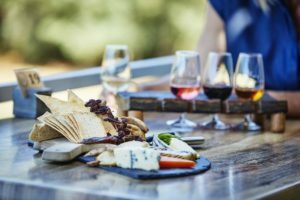 Just 20 minutes east of Perth, the Swan Valley and Darling Range is a world away from city life. 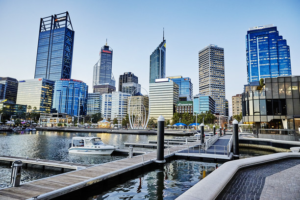 You can reach it by road, or take the scenic route aboard a Swan River cruise from Perth’s Barrack Street Jetty. You can even winery-hop in the back of a horse-drawn wagon or chauffeured classic car. 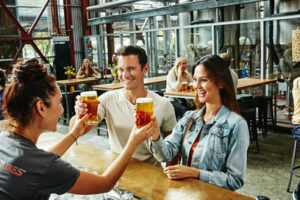 A huge shed (and former crocodile farm) on the water’s edge in Fremantle was to become the home of this beer and the birthplace of Little Creatures Brewing. Work began in 1999 and we swung the doors open in late 2000. Grab a pint & a pizza and soak in the brewery atmosphere or wander out into the backyard and enjoy your beer in the sunshine. There are plenty of adventures to be had at Rottnest Island. 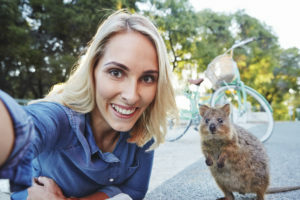 Don’t just limit yourself to swimming and bike riding, there are so many exciting Rottnest Island tours, ocean and island activities to be experienced. Just 30 minutes from Perth, the bustling, dynamic port city of Fremantle has long been renowned for its eclectic mix of arty and alternative types. 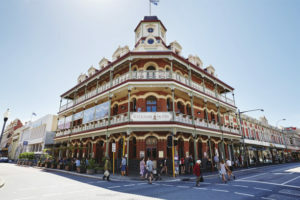 Fremantle’s streets buzz with the song of buskers, the side walks fill with a wild collection of art and music floats out from trendy cafés and bars. Spend a night or two with an excellent selection of accommodation options ranging from friendly backpackers to luxurious hotels. 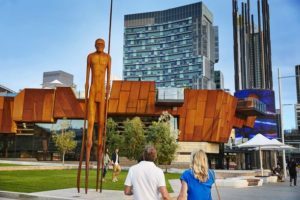 Yagan Square is the place to meet both day and at night with a large array of cafes, restaurants, shopping and pop-ups there are plenty of things to see and do. The Square has a vibrant lighting display on the underside of the canopies and is home to the iconic Digital Tower. Kings Park and Botanic Garden is one of the largest inner city parks in the world and is visited by over 6 million people each year. 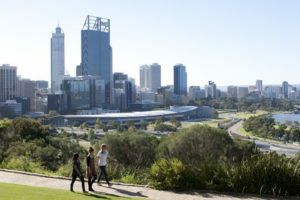 Kings Park’s stunning location overlooks the Perth City and the silken blue waters of the Swan River. From high above, you can see the brilliantly coloured sails of boats on the river, the twinkling lights of the city, the distant Perth Hills and the endless blue skies for which Perth is so renowned. 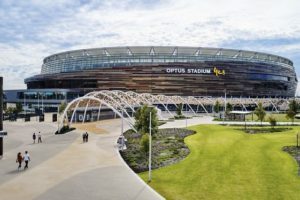 Perth’s newly built Optus Stadium opened in January 2018, offers visitors two unique dining experience both at the western end of the stadium showcasing 180 degree views of the Swan River. Stadium tours are available 7 days a week for all ages. You will be treated to a VIP experience with breathtaking views of the playing surface, the Swan River and Perth City. Discovering and reliving some of the greatest sporting moments and WA’s rich sporting history. While you’re in Perth, why not stay and explore more of what Western Australia has to offer. 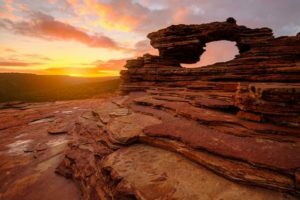 Kalbarri National Park is located 485 km north of Perth, in the Mid West region of Western Australia. The major geographical features of the park include the Murchison River gorge which runs for nearly 80 km on the lower reaches of the Murchison River.